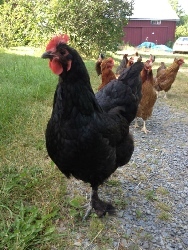 Sage Hen Farm in Lodi, NY, is in heart of the Finger Lakes, between Seneca and Cayuga Lakes. We moved to Lodi in 2001, but the land has been farmed since the early 19th century. We raise chickens for eggs, tend an orchard, grow garlic, and maintain a diverse market garden. Our focus is on heirloom and uncommon varieties. That applies to chickens, garlic, fruits and berries, herbs, greens, potatoes and other vegetables. It is our goal to practice sustainable growing methods and offer cultivars and crop varieties that you won't find in the grocery store. We raise free-ranging chickens for eggs in a rainbow assortment of colors and sizes. Each dozen we sell will include a mix of green/blue, white or cream, and light to dark brown eggs. The size and diversity of the flock varies, but it has ranged from 60 to more than 100 birds. We've had as many as twenty different breeds and varieties at the same time. They also have a much smaller flock of ducks and a few turkeys. 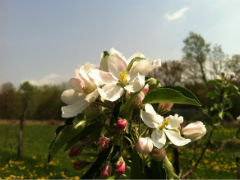 In our orchard and elsewhere on our property there are more than 100 trees, but many few varieties. They include 60 apple varieties, but also 10 peaches, 10 pear varieties, 5 tart cherry varieties, and 3 plums. We have concentrated on varieties that are cold hardy, have been venerated in past generations, and have regional significance. We host a cider pressing party every October, so for our apples, we have looked for varieties that blend well into a sweet, but complex, fresh cider. We live in an area that has had a recent boom in hard cider Rather than sell cider, which in New York State has to be pasteurized before it can be sold, we sell a non-pasteurized, non-alcoholic orchard elixir that is predominantly apple cider with some pear or other fruit juices mixed in. Margaret's specialty is garlic. We offer more than 70 varieties of garlic. The most frequent comment we here at farmers market is "I didn't know there so many kinds of garlic. There are: softnecks including many varieties each of silverskin and artichoke garlics; hardnecks including many varieties each of rocambole, porcelain and purple stripe. Some garlics have only a few large cloves; others have many layers of smaller cloves. Whether you are looking for a mild long-keeping garlic or a full bodied (either hot or just strong), white or brown or purply, we have a garlic for you. We also keep honeybees. We do it mostly so that our fruit trees and other crops will have plenty of pollenizers, but having our own honey is a treat. What is fascinating about honey, when you extract it from your own hives, is the different tastes, shades, and colors it has depending what flowering plants were in bloom when the bees collected nectar and pollen. We mostly sell our farm's produce to friends, colleagues, and neighbors, but nothing long distance. From third week of May to the end of October, you can find us Wednesday afternoons at the Trumansburg Farmers Market. We've now been doing this for a decade. Members of NOFA-NY (Northeast Organic Farmers Association -- New York), we grow certified organic seeds, sets, and tubers using ecologically sound methods: no chemical pesticides, synthetic fertilizers, or GMOs (genetically modified organisms). To us, it seems the right thing to do. 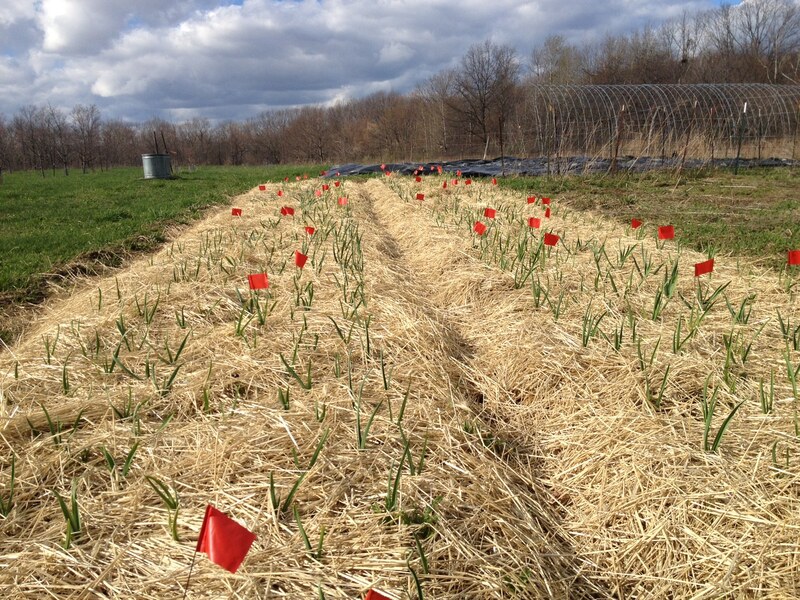 Sage Hen Farm has taken NOFA-NY's Farmers Pledge each year since 2007. For seeds, bulbs, and tubers to supplement what we save ourselves, we use sources that specialize in cold-hardy varieties, practice sustainable growing methods, and offer certified organic cultivars and regional heirloom varieties. In addition, when we rented out 30 acres of our land for haying to a local farmer in 2012, he had our fields certified organic. We are Margaret Shepard and John Henderson. Our address in Lodi is 2343 Parmenter Road. It is about three miles south of the village of Lodi and about nine miles northwest of Trumansburg, NY. You can contact Margaret at [margaretbshepard @ gmail.com] John can be reached at [jrhenderson9@ gmail.com]. You can find pictures, news, and other information about the farm on Facebook. This page written and maintained by John R. Henderson [jrhenderson9@ gmail.com].